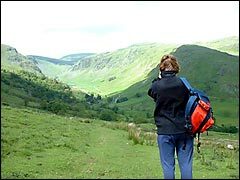 On the final page of our Cumbrian holiday in the Lake District we enjoyed two car-free days with a bit of Fell walking from the Staveley holiday cottage; the first in the beautiful Kentmere Valley and the other walk alongside the River Kent along the Dale Way. 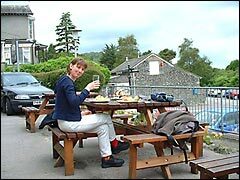 We also visited Grange-over-Sands, and enjoyed a pub meal at Ings. 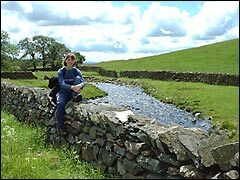 ...at this splendid spot to admire the beautiful Kentmere Valley scenery by this stream. 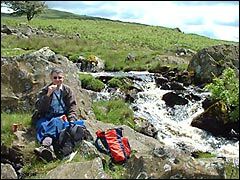 We'd done a few miles uphill and were looking for a suitable scenic spot to consume our picnic, it's amazing how hungry you get walking in the Cumbrian Fells. ...another shot in the bag, a picture of Longsleddale. Despite it being high summer and sunny, we still found it chilly in the Cumbrian Fells, and also quite boggy underfoot owing to the abundant amount of rainfall that hits the Lake District. All very scenic though. Safely back in our Staveley holiday cottage we enjoyed a candlelit fish and chip dinner from the local shop, washed down with plentiful red wine. This was the evening of our 12 mile Kentmere Fell walk, sure were glad of the bath to soak in and sooth those aching legs. 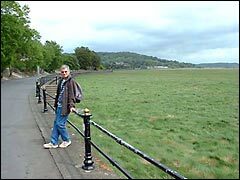 Looking out across Morecambe Bay from Grange-over-Sands we wondered where the sea had gone - it was all grass! This town just didn't float our boat and seemed rather uninspiring; moral: don't believe everything you read on tourism websites. The one redeeming feature of Grange-over-Sands was the pub we found for lunch, we were able to sit outside which was just as well owing to the very smoky atmosphere inside. Our tourist links page lists the website that recommended this town! Now this eating at pubs is getting a bit of a habit on holiday! 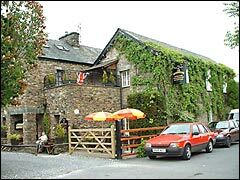 In the evening we visited the Watermill Inn in Ings, the next village along from Staveley, where we enjoyed another wonderful meal in the lovely Lake District, washed down with plenty of the local ale. Now that's what we call a plentiful plateful in the Watermill Inn in Ings. 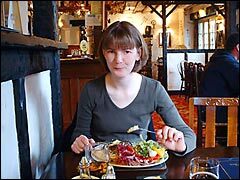 On our last night we did a pub crawl of all three Staveley pubs after another yummy meal in the pub where we'd dined earlier in the week. On our last day in the Cumbrian countryside we headed out on another Fell walk, the Dale Way, which mainly followed the River Kent. It was pretty wet for most of the day, but we set off despite the rain. 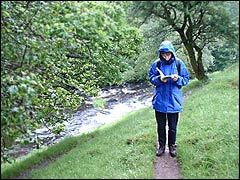 The walk guide book quickly became super soggy on the Dale Way walk, in fact it started to disintegrate later in the day due to the relentless rain! 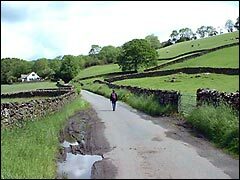 But you try to made the best of it, after all the Lake District isn't known as the wettest area of the UK for nothing. 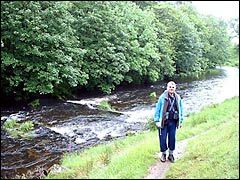 Here a decidedly drenched Mike put on a brave face for the camera, the point at which Belinda was tempted to push him into the river for deciding to go Fell walking on such a dreadful day! Check out our video clips of our Cumbrian holiday. 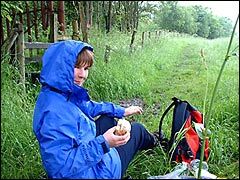 Fortunately we'd brought a bin liner to sit on while eating our lunch which was just as well as we couldn't find anywhere dry to sit. 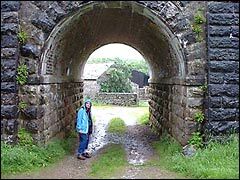 But we wimped out and cut the Dale Way walk short in the end owing to the woeful weather, only doing eight miles instead of the full twelve or so, longing to get back to the Cumbrian holiday cottage for a nice long soak in the bath. Oh, did we say it rained? Belinda's case always seems to be bulging at the seams for the return trip on our holidays - this time it must be all that Kendal Mint Cake she bought stuffed in it! Despite the 'iffy' weather we still had a most enjoyable week in the very scenic Lake District; it's a vast area and of course we only got to see a small part of it, we'd need far longer next time. Our advice for anyone visiting? Take a mac! We've also holidayed in the Peak District.